Following West Virginia’s lead, teachers in Kentucky and Oklahoma are walking out and demanding change, while teachers in Arizona are considering doing the same. Some teachers say students who participated in the March for Our Lives actions across the country inspired them to speak up. But the tipping point goes deeper than that. Teachers have finally had enough. Why? Because teachers across the country have watched their states make dramatic cuts to investments in schools, students, and teachers—often while those same states implement tax breaks for individuals and corporations. Teachers are concerned with a range of issues, from books and supplies to safe buildings. And they are burdened by growing pay inequities. Over the last two decades, teachers are contributing more and more toward health care and retirement costs as their pay falls further behind. Teacher pay (accounting for inflation) actually fell by $30 per week from 1996 to 2015, while pay for other college graduates increased by $124. In short, the teacher pay gap—the difference between what teachers earn in weekly wages compared with similarly educated and experienced workers—has widened significantly. Even when accounting for benefits, the teacher compensation gap increased by 9 percentage points, to 11.1 percent over that same time frame. Teacher pay gaps vary considerably across the United States as indicated in the figure.1 The figure below shows within-state ratios of public school teachers to other college graduates. The ratio for the overall United States is 0.77, meaning that, on average, teachers earn just 77 percent of what other college graduates earn in weekly wages. Arizona (0.63) has the lowest ratio (the largest pay gap), while Wyoming (0.99) has the highest ratio (the smallest pay gap). Note: Figure compares weekly wages. State totals are weighted averages of the B.A.- and M.A.-level weekly wages where the weights are the shares of teachers with a B.A. or M.A. This ensures that the distribution of education among teachers and other college graduates does not affect the comparison. Data are for workers age 18–64 with bachelor's or master's degrees and positive wages (excluding self-employed workers). 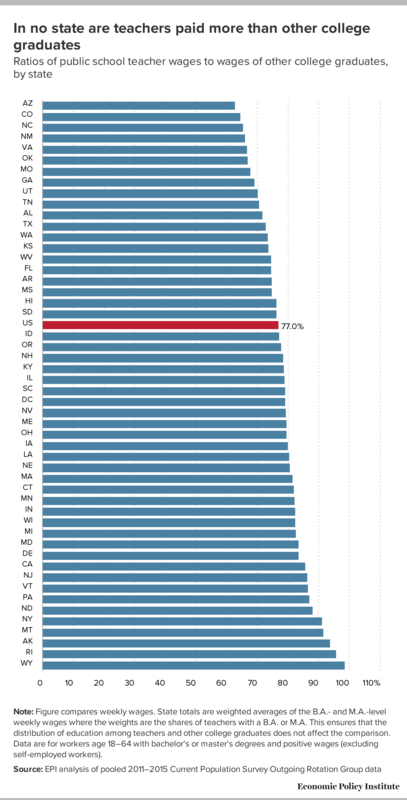 Not surprisingly, striking teachers live in states with some of the largest pay gaps. In Arizona, teachers earn just 63 cents on the dollar compared with other college graduates. That gap is 79 cents in Kentucky, 67 cents in Oklahoma, and 75 cents in West Virginia. These gaps amount to vast differences in earning over a career. It is not surprising that there are teacher shortages across the United States as college students, especially women, choose other professions. In 18 states, public school teacher weekly wages lag by more than 25 percent. There is no state where teacher wages are equal to or better than those of other college graduates. Teachers are acutely aware that students are the future of this country. Yet we are not able to adequately prepare our greatest assets, our students, if we don’t adequately invest in our teachers. It’s little wonder that strikes and walkouts are occurring now. Given the trends in pay and benefits, many more teachers may soon be joining the picket lines. 1. The data employed here do not allow for a robust regression analysis for each state, but simple within-state ratios of public school teachers to other college graduates are informative as we implicitly account for gender, education and residence. We used pooled 2011–2015 CPS-ORG data to calculate state wage ratios. Comparing straight pay confounds other issues such as cost-of-living differences across states. Here the comparisons are made within each state.